Frome in Somerset has been hit by another shocking food attack. 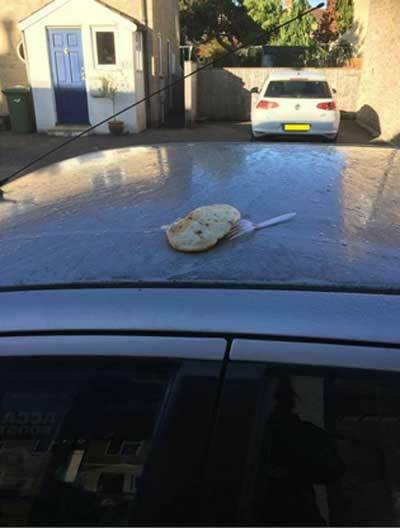 Pitta bread was found on the roof of a car outside Coral Bookmakers in the Keyford area of Frome on Saturday morning. The bread was left on the car roof nestled next to a plastic fork . The incident was discovered by Louise Bond as she was taking her daughter to ballet. Ms Bond said: "I was walking along Keyford taking my little one to ballet and I saw the car with the pitta on it and the fork. "It was Saturday morning when I took the picture so it must have been put there on Friday night I presume." 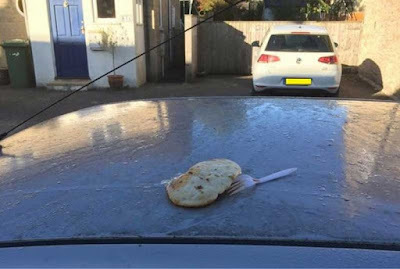 This is not the first instance in which food has been found on the roof of a car in Frome. Chips were seen on a car back in August. First three words that came to mind!